Last week I went to Penn Quarter farmer's market and bought bread, tomatoes, mozzarella and basil. I thought these ingredients absolutely screamed summer and decided to make a salad from them. 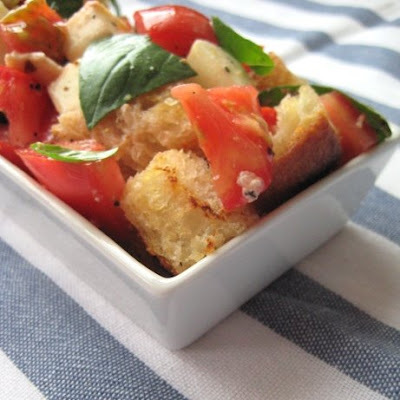 Panzanella is a bread salad usually made from bread, tomatoes and olive oil. This time, I decided to add fresh mozzarella. 1. Heat a bit of olive oil in a pan and saute the pieces of bread until they turn slightly golden. You can completely ignore this step and add the bread without sauteing it first, but the bread then would turn super soggy in the salad...and who wants that? 2. 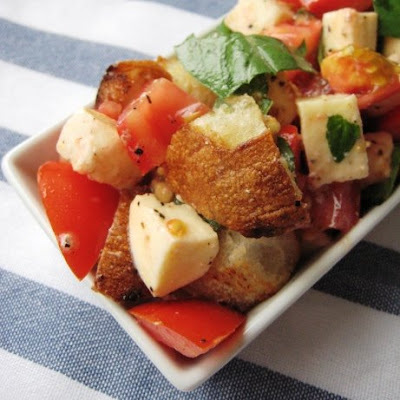 Combine tomatoes, basil, mozzarella and sauteed bread. Drizzle with olive oil and season with salt and pepper. Thank you for this recipe! I actually had a similar dish at a bridal shower I went to recently. I thought it was such a great concept! They may have added balsamic vinegar as well. Yum! So easy and simple. I love using fresh ingredients! These look great! Simple yes, but you can't go wrong with this list of ingredients :)... yummy! What a gorgeous salad. It's simple but packed with flavor. Thanks for sharing it with us. 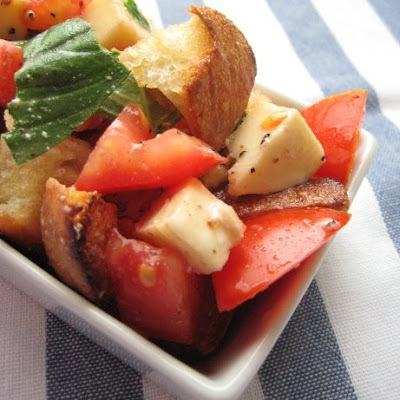 Your panzanella looks gorgeous. It's a perfect salad in my opinion! I can't wait until there are good tomatoes at my local farmers market! That looks amazing and healthy too! I would definitely sautee the bread if I tried this! I'll make that right now for my late lunch (it'll have to be with french bread today)! Sounds awesome! Simply fresh ingredients and lovely salivating pictures! 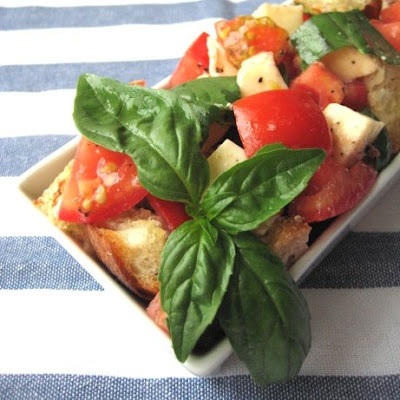 I love panzanella! I only ever made this myself once and then it went rather wrong. The recipe called for just regular bread, so no toasting or anything and as you said... it turned soggy... bleh... Yours looks and sounds fabulous though. Really have to remake it! This just screams summer! It looks fantastic. I made this for dinner last night and it was delicious! I used mozzarella that was packed with Italian herbs and olive oil, so I didn't add any extra seasoning or olive oil to the salad. I also added an avocado I had been needing to use. I LOVED this recipe so much I'm going to make it at least once more this week. Probably tomorrow to bring for lunch. The toasted bread is pure genius!